Colourful archaea at Midway Geyser. The Archaea (or Archea) are a group of single-celled organisms. The name comes from Greek αρχαία, "old ones". They are a major division of living organisms. Archaea are tiny, simple organisms. They were originally discovered in extreme environments (extremophiles), but are now thought to be common to more average conditions. Many can survive at very high (over 80 °C) or very low temperatures, or highly salty, acidic or alkaline water. Some have been found in geysers, black smokers, oil wells, and hot vents in the deep ocean. Recent research has found ammonia-eating archaea in soil and seawater. In the past they had been classed with bacteria as prokaryotes (or Kingdom Monera) and named archaebacteria, but this classification is a mistake. The Archaea have an independent evolutionary history and show many differences in their biochemistry from other forms of life. They are now classified as a separate domain in the three-domain system. In this system, the three distinct branches of evolutionary descent are the Archaea, Bacteria and Eukaryota. Archaea are, like bacteria, prokaryotes: single-celled organisms that do not have nuclei and cell organelles of the eukaryote type. No archaean species can do photosynthesis. Archaea show high levels of horizontal gene transfer between lineages. Many archaea live in extreme environments. 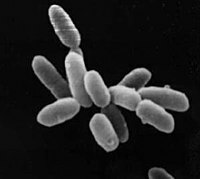 Unlike bacteria, no archaea produce spores. Carl Woese discovered the Archaea by 1978, and proved it was a separate Kingdom by 1990. Barry E.R. & Bell S.D. 2006. DNA replication in the Archaea. Microbiology and molecular biology reviews (MMBR) '70, 876-887. Kelman L.M. & Kelman Z. 2003. Archaea: An archetype for replication initiation studies? Molecular microbiology, 48, 605-615. ↑ Pace NR (May 2006). "Time for a change". Nature 441 (7091): 289. doi:10.1038/441289a . PMID 16710401 . ↑ Howland, John L. (2000). The surprising Archaea: discovering another domain of life. Oxford: Oxford University Press. ISBN 0-19-511183-4 . ↑ Garrett RA, Klenk H (2005). Archaea: evolution, physiology and molecular biology. WileyBlackwell. ISBN 1-4051-4404-1 . ↑ Schaechter, M (2009). Archaea (overview) in The desk encyclopedia of microbiology, 2nd edition. San Diego and London: Elsevier Academic Press. ISBN 978-0-12-374980-2 . ↑ de Queiroz K (2005). "Ernst Mayr and the modern concept of species". Proc. Natl. Acad. Sci. U.S.A. 102 (Suppl 1): 6600–7. doi:10.1073/pnas.0502030102 . PMC 1131873 . PMID 15851674 . http://www.pnas.org/cgi/pmidlookup?view=long&pmid=15851674. ↑ Eppley JM, Tyson GW, Getz WM, Banfield JF (2007). "Genetic exchange across a species boundary in the archaeal genus ferroplasma". Genetics 177 (1): 407–16. doi:10.1534/genetics.107.072892 . PMC 2013692 . PMID 17603112 . http://www.genetics.org/cgi/pmidlookup?view=long&pmid=17603112. ↑ Papke RT, Zhaxybayeva O, Feil EJ, Sommerfeld K, Muise D, Doolittle WF (2007). "Searching for species in haloarchaea". Proc. Natl. Acad. Sci. U.S.A. 104 (35): 14092–7. doi:10.1073/pnas.0706358104 . PMC 1955782 . PMID 17715057 . http://www.pnas.org/cgi/pmidlookup?view=long&pmid=17715057. This page was last changed on 16 December 2014, at 20:37.